SYDNEY, Australia, Jan. 21, 2019 /PRNewswire/ -- As the Intergovernmental Panel on Climate Change (IPCC) Special Report warned in October 2018, the planet must be kept below the dangerous temperature rise of 1.5°C above pre-industrial levels if we are to avoid a worsening of climate-related impacts. We are already seeing the devastating consequences of a 1°C global temperature increase, including ever-rising sea levels, extreme storms, prolonged droughts, and intensified wildfires. Now, after two years of research and modeling by leading scientists at the University of Technology Sydney, the German Aerospace Center, and the University of Melbourne, a groundbreaking new framework offers a feasible roadmap for achieving--and surpassing--the targets set by the 2016 Paris Climate Agreement. This research effort was funded by the Leonardo DiCaprio Foundation as part of its new One Earth initiative. The research* produces the most detailed energy model to date, with 72 regional energy grids modeled in hourly increments through 2050, along with a comprehensive assessment of available renewable resources like wind and solar - and configurations for meeting projected energy demand and storage most efficiently for all sectors over the next 30 years. Lead author Dr. Sven Teske, Research Director at the University of Technology Sydney's Institute for Sustainable Futures, said: "Scientists cannot fully predict the future, but advanced modeling allows us to map out the best scenarios for creating a global energy system fit for the 21st century - and with momentum around the Paris Agreement lagging, it's crucial that decision makers around the world can see that we can, in fact, meet global energy demand at a lower cost with clean renewables." While climate scientists have created hundreds of models to help policymakers understand the impacts of climate change and how to mitigate them, nearly all of these models have relied upon negative emissions technologies, which are expensive and not proven to work at scale. This model is the first to achieve the required negative emissions through natural climate solutions, including the restoration of degraded forests and other lands, along with a transition to 100% renewable energy by mid-century. Malte Meinshausen, Founding Director of the Climate and Energy College at the University of Melbourne and Potsdam Institute Fellow, said: "Citing a growing body of research, we show that using land restoration efforts to meet negative emissions requirements, along with a transition to 100% renewable energy by 2050, gives the world a good chance of staying below the 1.5°C target." A transition to 100% renewables and the implementation of natural climate solutions offer additional benefits beyond keeping the climate system in check. The energy transition will be able to recycle our natural gas infrastructure and create millions of permanent jobs. Natural climate solutions could also dramatically increase sustainable livelihoods in the developing world, offering better water security and reduced soil erosion. Justin Winters, Executive Director of the Leonardo DiCaprio Foundation, said: "Nature is the key to solving the climate crisis. Currently our wildlands and oceans absorb one-half of all CO2 emissions. While the renewable energy transition is imperative to solving the climate crisis, it isn't enough. As this climate model shows, in order to keep the global temperature rise to no more than 1.5°C, we have to keep our natural carbon sinks intact, scale up restoration efforts and shift to regenerative agriculture." 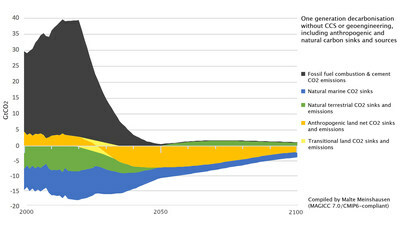 The proposed energy transition outlined in the climate model is estimated to cost approximately $1.7 trillion per year. This sounds like a lot, but it pales in comparison to the vast subsidies that governments currently provide to prop up the polluting fossil fuels largely responsible for climate change, estimated at more than $5 trillion a year - $10 million a minute, every day, according to the IMF. The research tells us that we could be creating the clean energy future we so desperately need for one-third of the cost. Leonardo DiCaprio, Founder of LDF, said: "With the pace of urgent climate warnings now increasing, it's clear that our planet cannot wait for meaningful action. This ambitious and necessary pathway shows that a transition to 100% renewable energy and strong measures to protect and restore our natural ecosystems, taken together, can deliver a more stable climate within a single generation." Founded in 1998 with the mission of protecting the world's last wild places, LDF is dedicated to the long-term health and wellbeing of all Earth's inhabitants. The foundation support projects around the world that build climate resiliency, protect vulnerable wildlife from extinction, and restore balance to threatened ecosystems and communities. LDF's grantmaking program, totaling over $100m to date, supports conservation projects and innovative solutions in 60 countries. ISF is an interdisciplinary research and consulting organisation setting global benchmarks since 1997 in helping governments, NGOs, businesses and communities achieve long term sustainable solutions that protect and enhance the environment, human wellbeing and social equity. In climate change and the energy sector, ISF has developed advanced models to holistically examine the global energy system, region by region - from financing and business models, to policy and regulation, to technological and infrastructure analysis, including links to urban water and waste systems. The DLR is one of Germany's largest federal research centers with a staff of 8,000. Its program includes the fields of energy and transport, specifically for efficient energy systems and the technological, environmental, and economic potentials of renewable energy in the context of energy economy, advanced energy system modeling, development of energy scenarios, and the analysis of future vehicle concepts for road and rail traffic. UM co-leads a new bilateral research collaboration with top German institutions including the Potsdam Institute for Climate Impact Research (PIK) to perform research into the economic opportunities of a zero carbon future. UM also houses the Australian-German Climate & Energy College where the MAGICC climate model is maintained that is used throughout various IPCC Assessment reports, including the Special Report on 1.5˚C.